WE SELL DIRECT TO THE CONTRACTOR, COMMERCIAL, & INDUSTRIAL MARKET! PumpExpress.com is dedicated to supplying customers with the highest quality pumps, parts, controls and electric motors on the market at the lowest prices. We stock all major brands including Armstrong pumps, Paco Pumps, Bell & Gossett, Berkeley, Taco and BJM among many others. Our Customer Service Representatives are pump experts able to provide skilled selection and sizing assistance. In addition, our application engineers will work with you to select equipment that is custom fitted for your applications. At Pump Express, We strive to deliver our products quickly and affordably. Visit our about us page to learn more about our company. We are 100% invested in delivering solutions to pump problems. Our system engineers bring years of experience and training in commercial, industrial and residential pump applications to every conversation and are on hand to answer a wide variety of pump-related inquiries. 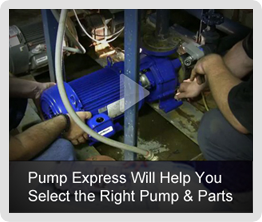 Looking for a specific pump or hard-to-find pump replacement part? Our on-line pump catalog lists model numbers, part numbers, curves and sizing for every major pump manufacturer. Can't find what you're looking for? Call us, we'll help you. HOW LOW CAN WE GO WITH OUR PUMP PRICES? Pump Express is a National distributor and discount pump supplier. We offer one of the largest selections of pumps at very low prices anywhere in the country. The Express in our name is about quick delivery. If we don't have an item in stock, we will have it sent directly from the manufacturer to your door. We offer overnight delivery so that our customers get what they need when they need it. When you buy pump products from Pump Express, you get them quickly and pay less. Call our Sales desk at 1-800-429-0800 and ask about our LOW PRICE GUARANTEE! How low can we go? Call us and find out.